﻿ A Story a Week : Once was Enough! There is really only one possible topic for this week's story. Last week this theme tried to push its way to the top of my list, but I held off, and this week it has done the same thing, but in spades. OK, I give in! Anything, but please not again next week! 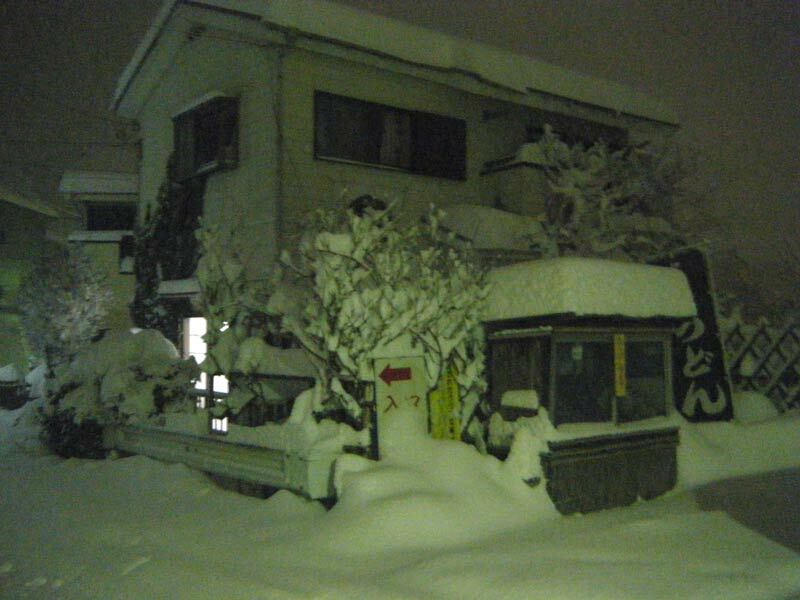 The Kanto region where I live, and which includes the Tokyo metropolis, isn't one of Japan's heaviest snow areas. 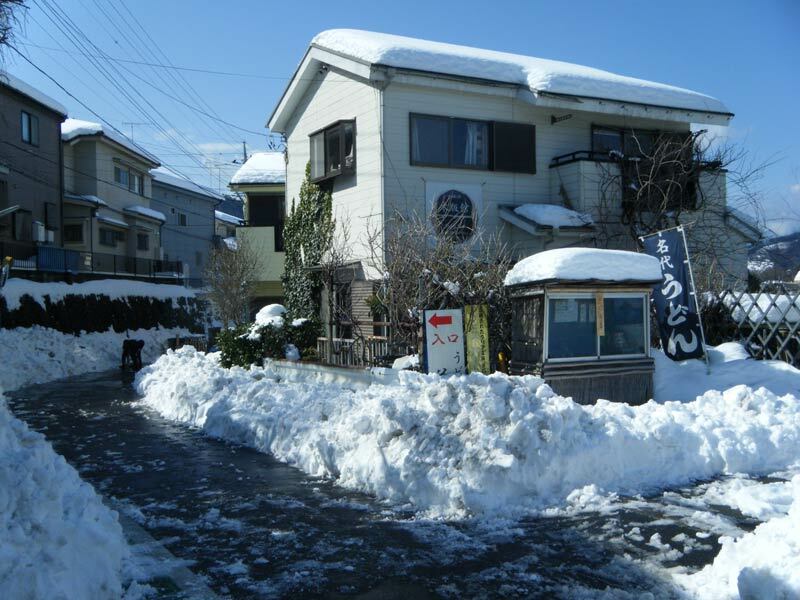 To experience good deep snow you either have to head to Hokkaido, up into the Alps, or over to the Japan Sea coast, the area known as yukiguni ('snow country'). Here in Tokyo, we'll perhaps get snow just once or twice in a typical winter, usually only around 10~20cm or so, and it's almost always gone within a couple of days. Up until last week, we thought that we might manage to get right through this winter with no snow at all. Not only have we had no snow, we have barely even seen any clouds. It's been day after day of beautiful clear blue skies. Now because snow isn't usually a big deal around here, City Hall isn't really ready for it. They have a few trucks that can clear snow, but these are kept busy keeping the main roads and highways open. People like us on back streets are left to our own devices. The streets ended up somewhat narrower than they usually are, but at least they were passable. Over the next few days, under more clear blue skies, the snowbanks shrunk somewhat, but before they could disappear - as I mentioned above - we had a replay, an almost exact replay, this time beginning on Friday about noon and continuing on through Saturday morning, turning to rain for the last couple of hours. A long ruler I shoved into the snow just after it finally stopped showed a depth of over 560mm, just a shade under two feet. I've been here nearly thirty years, and I have never seen anything like this, and it's not just me. Even the old-timers in the neighbourhood were going around telling everybody "We've never had it like this before ... never!" But once again, out came the shovels, and by late afternoon we had it mostly done. It was more difficult this time not just because of the left-over snow from the week before, but because that final 'touch' of rain had made the snow extremely heavy to shovel. To let that selfish guy try and bash through would have made a complete mess of the work we had done so far, not to mention packing down the snow in the areas we had not yet touched, making our work much more difficult. I shouldn't close on that negative note; we had a very enjoyable day, neighbours who don't get to see each other all that often, laughing and chatting as we shoveled away ton after ton of the sticky white stuff. And everybody making the same kind of joke - waving a fist at the sky "OK, we get it! We've had it pretty easy for a long time, and we've now had our taste to remind us what winter is all about. But twice is enough, OK?!" There is another interesting aspect that I didn't mention in the story itself. If you had taken a survey of the snow-clearing crew, asking everybody their age, it would have shown an interesting gap. There were a few kids playing around while we worked, but no teens, no 20s, and (I suspect) no 30s. A scattering of 40s, then plenty of 50s, 60s and 70s. There were also some even older than that, helping out with the lighter scraping work, rather than doing heavy shovelling. No teens, and no 20s. None. Would it be any different in your country? As I recall it was mostly the same range clearing in my neighborhood. Though maybe more in their late 20s as young families seem to be a large portion of the local population. (sometimes it feels like half the population of japan is young mothers and their small children looking at my neighborhood and commute.) I wasn't much help either as I had no real means of shoveling and not actually knowing anyone felt to shy to ask if help was needed.